Post-care skincare for the summer season! Sun-kissed skin may look cute, but we all know that the post-beach burn never feels as good as it looks. Wash the sand and salt away with a cold shower, and cleanse away that greasy feeling from sunscreen. A cold shower is one of the greatest—and cheapest—remedies to that burnt feeling from being under the sun for too long. The cool water minimizes the itch and burn. All the more reason to take a long(er) shower! Exfoliating after a beach trip helps sheds off dry and damaged skin cells and gets rid of dark spots and even out your skin tone. Do note that if your skin is red due to a sunburn, you have to let it heal before scrubbing away, to prevent from further irritating it. Peeling or flaking of skin due to dryness is a huge problem. Hydrating lotions and face mists should do the trick to restore your skin’s natural pH balance and radiant glow. Or better yet, slather on some coconut oil to nourish your skin back to suppleness. 4. Don’t forget your hair! The salty air and harmful sun rays can also take a toll on your tresses, so make sure to treat your hair after playing out in the sun. Cleanse away the beach residue and deep condition those locks after your trip to keep it healthy. You don't want to end summer with severely dry hair, after all. Always, always, always keep yourself hydrated. Your 8 glasses of water a day becomes even more important, as we sweat more this season. Your h2O intake helps reboot and revive your skin from the inside out to keep that skin looking fresh and glowing. Seal in your skin’s moisture and rid of uneven tan lines while you’re at it with lotions that are infused with ingredients that work to nourish and protect your skin. 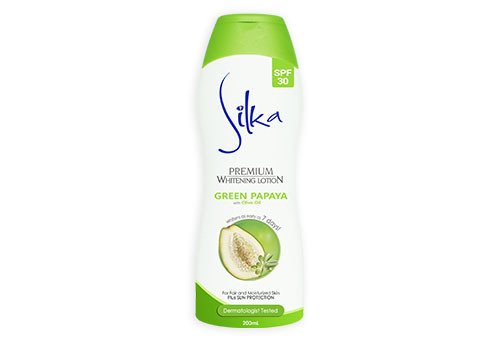 Try Silka's Premium Whitening Lotion Green Papaya which comes with olive oil that helps whiten and moisturize skin, and SPF30 which protects it from the harmful rays of the sun. Of course, Fighting the effects of the sun doesn’t just happen when you’re on vacay mode. There is no escaping the sun’s dry spells whether you’re in the beach or at the city after all so never cut back on sunblock and moisturizers even on a normal day. For more information about Silka, visit their page here. This article was created by Summit Storylabs in partnership with Silka.